Nutella is one of my favorites. Last fall I had a hazelnut yogurt from Pinkberry (while in California because I can't find a Pinkberry in Oklahoma)... it was the most delicious yogurt - EVER! Seriously, Pinkberry is always at the top of my list when I'm in California. I usually just like the original tart yogurt with some fruit and maybe some chocolate shavings. And I always try a taste of whatever new flavor they are sampling. But I absolutely fell in love with the hazelnut yogurt. So if you are anywhere near a Pinkberry - oh wait - they might not even have the flavor any more - but if they do, you HAVE to try the hazelnut yogurt. OK - this really is supposed to be about Hazelnut Frosting. It has Nutella in it, which is also good simply eaten on a spoon like peanut butter. 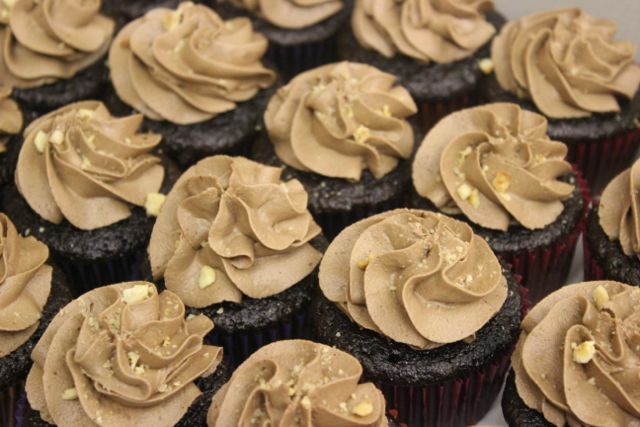 Top your favorite chocolate cupcake with this frosting. Using an electric mixer, beat the butter and vanilla until smooth. Add the cocoa powder and powdered sugar and mix on the lowest speed at first (be careful because if you mix it to fast right away, the powdered sugar will just fly in your face, on the counter, on the floor, all over your kitchen in a powdery white mess - trust me... I've done it a thousand times and still haven't learned my lesson). Add the water and Nutella and mix until smooth and creamy. You may need to add extra water or milk to get the creamy texture. 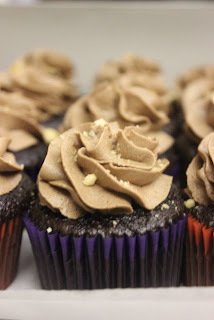 Use a pastry bag with a large star tip or a spatula to frost a chocolate cupcake (or a two dozen). Sprinkle with crushed toasted hazelnuts if desired. This recipe makes enough to generously frost about 24 cupcakes.